A lifestyle blog which amalgamates with beauty, general awareness, and online work plans. A place where you get an idea of what's new and trending in our life, to live a better lifestyle. A name which has made his goodwill by delivering pure natural quality products for skin and hair care. Yes, this is AROMA ESSENTIALS, it comes with a natural solutions by utilizing the natural products and their extracts for the common problems we faced in our daily routine. Packaging : Transparent plastic bottle with white cap. This cap is screw type with a flip. Transparent bottle will give you an idea of the material inside the bottle. Skin Suitability : All type of skin, Pigmented skin, Normal to Dry skin. 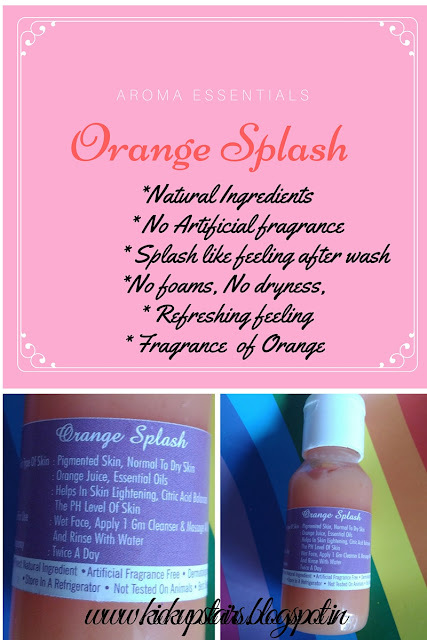 Directions for use: First wet your face and then apply 1 gram of cleanser and massage all over the face and then rinse the face with fresh water. I have an oily skin and it gets worst during summer, I need to wash my face again and again. Repeated washing decreases my skin's moisture and I was in the condition that not able to apply moisturizer & can't live without moisturizer. Here this product is like miracle, it removes all extra oil from my face without harming my skin moisture. 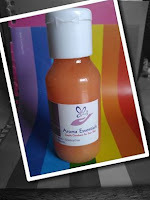 This cleanser is foam free and cleans your face gently. A regular use of this product will also lighten your skin and improves the quality of your skin. I was using this product from last one week with two washes as recommended on the product's label. Apart from its qualities, its fragrance is mild and you can easily recognize that its Orange's fragrance. This is in gel form and little thick, you need to press the bottle little more to get it out from its nozzle. And always apply it after wetting your face to get the good results. You must know that Aroma Essentials never test their products on Animals. So Hats Off to Aroma. Quite impressed with the product and recommend to all, I must say give it a try.